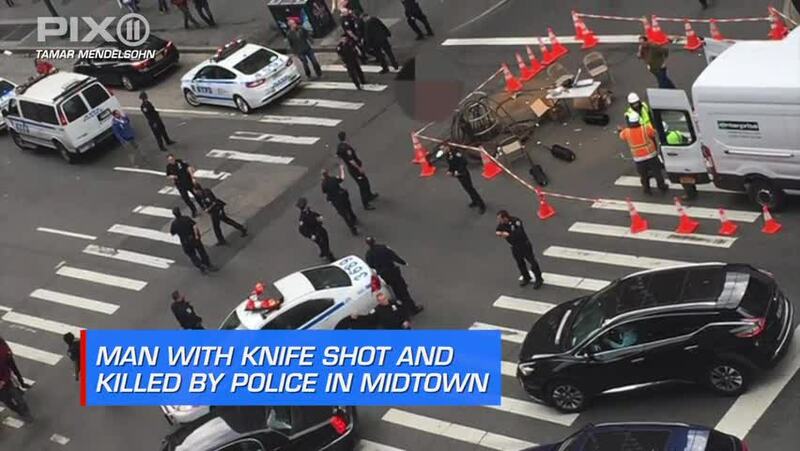 MIDTOWN, Manhattan — A knife-wielding man was shot and killed by police in midtown Wednesday morning after he allegedly stabbed a woman, law enforcement sources said. It was during the morning rush commute when officers opened fire near West 49th Street and Eighth Avenue at about 8:30 a.m., fire officials said. The man was struck and pronounced dead at the scene. Eighth Avenue is closed for the investigation, an NYPD spokesman said. The culprit, whose name has not been released, allegedly stabbed a woman in her wrist, a law enforcement source said. She's been taken to a hospital with non-life threatening wounds, the source said. Police are investigating whether the deceased lunged at the officers with his weapon, the Associated Press reports.